Please accept my humble obeisances in the dust of your lotus feet. All glories to you. It is only now, thirty-five years later, that I have obtained, by your mercy, a tiny but precious attraction to Sri Krsna, His name, His fame, His associates and this land, His most beloved Sri Vrindavan Dhama. For that I am very grateful. But I will be honest; my strongest attachment is still to you and you alone. How could it be otherwise? You are my connection to Krsna. Through service to you, I serve Him. Your instruc-tions are always the foremost thing in my mind. You told me personally: “Preach boldly and have faith in the holy names.” That one instruction gave birth to all the good fortune in my life and will continue to maintain me until my final breath. 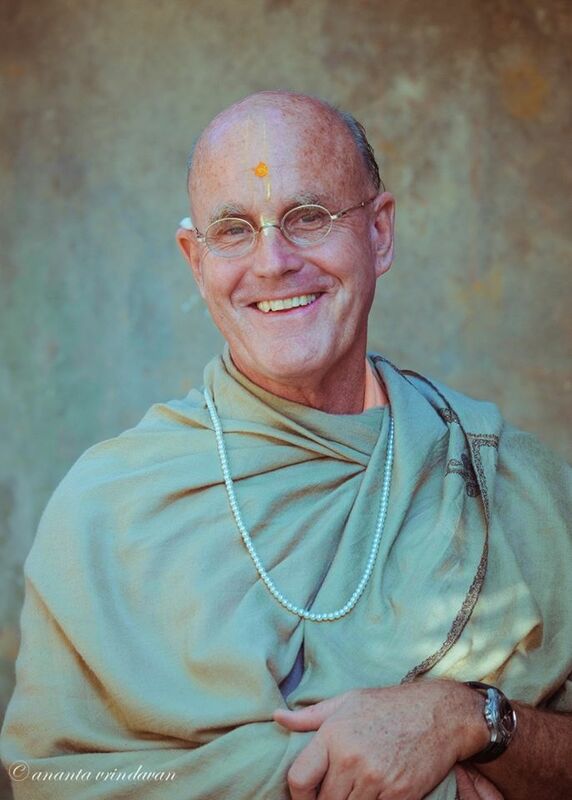 In pursuit of that order, I have in turn instructed my own disciples to do the same; together, we, along with our entire ISKCON movement, are trying our best to spread the glories of the Holy Names far and wide. If there is any lamentation in my life, it is simply that as old age approaches I see there is still so much service to be done, but so little time in which to accomplish it. Nevertheless, there remains the deep satisfaction that comes from seeing countless people all over the world touched by the mercy of your divine grace through the service of your faithful followers. And that is true even here in Sri Vrindavan Dhama. The other day our parikrama party visited a remote village in Vraja. As we entered the village a farmer noticed us and called out, “Jai Prabhupada, Jai Prabhupada! Jai Prabhupada!” as he loaded his bullock cart with cow dung. Others villagers who were nearby heard his cries, and also called out loudly “Prabhupada! Prabhupada! Prabhupada!” It was like a transcendental chorus and it was music to my ears. How wonderful it is that you, the one who made Vrindavan famous throughout the world, are honored and remembered by those who live here even now. "Your instructions are always the foremost thing in my mind." Later that day, a school teacher in the same village invited me into his humble home. It was nothing more than a ramshackle dwelling with a few rooms and courtyard that had in it three cows and an old buffalo. As we entered a dusty room I was shocked to see a full set of your English Srimad Bhagavatams resting on a spotlessly clean shelf. Noting my surprise the schoolteacher beamed and said, “I only read your spiritual master’s books. Whatever I know about Vrindavan I have learned from him.” Standing there, I was so proud to be your disciple. As we were leaving the village, another man noticed us and said to his friend, “Who are they?” The friend replied, “They are Vraja-vasis from Rama Reti.” He didn't call us as foreigners; he identified as genuine Vraja-vasis. I can't think of anything more honourable than being called a Vraja-vasi, especially by a Vraja-vasi. Thank you Srila Prabhupada for bringing us here to Vrindavan, our eternal home, where, by your mercy, we are embraced by the local people. Of course, I know it's too early for me to retire. Your instruction to me to preach remains intact. Even if it means defying the laws of nature, I will try to increase my preaching a thousand-fold as each year passes. And why not? You did it. At the advanced age of sixty-nine, you took on the greatest challenge of bringing Krsna consciousness to the west. May I follow in your illustrious footsteps! In the Krsna consciousness movement our stated goal is to one day, with purified hearts, see the Lord face to face again. I hope I am not breaking with tradition by saying that my cherished goal is to once again see you, my beloved Lord and master, face to face. Having your darsan again will naturally mean seeing Krsna, for in the spiritual world, I will serve you in your service to Him. That will be my greatest pleasure and my greatest treasure. But it seems such a long time to have to wait. Fortunately I sometimes see you in dreams. You once told your disciple Hayagriva that although most dreams are simply functions of the mind, dreams of the spiritual master are of spiritual significance. Nervously I said, “May I come with you Srila Prabhupada?” You nodded and I followed you down to the beach. Again you nodded slightly and I held your hand as you entered the water. As the first waves crashed against you, I held you firmly and you quickly splashed some water on yourself. Shortly thereafter you indicated we should leave. We came out of the water and I helped dry you off and then handed you your clothes. When you were dressed, I gave you your glasses and finally your cane and we started walking back to your room. A few meters from the house, you stopped and turned to me. I was too embarrassed to reply. “Alright,” you said. “You can travel with me. Your service will be to prepare my bath, cook for me and carry my bags."